The 2019 Australian Open - the year's first major - has certainly lived up to its expectations and is destined for an exciting finale clash between the top two players in the men's game. The tournament saw some great champions battling hard, as well as a bunch of talented youngsters of the new generation catching the eye. Be it Stefanos Tsitsipas' emergence on the big stage or Frances Tiafoe's impressive performances against some big names, the event lived up to its billing almost perfectly. 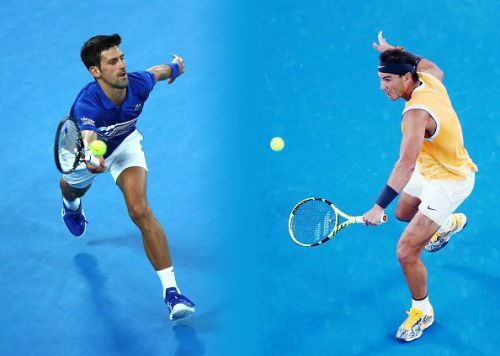 The final promises to be another intriguing watch as world number one Novak Djokovic is up against Spanish workhorse and number two Rafael Nadal in Melbourne's showpiece event. Djokovic enjoyed an excellent year in 2018, especially after winning the last two slams and entering this tournament in fine form. Nadal on the other hand, had a dream start last season after securing his whopping 11th French Open title in Paris, before defeats in the Wimbledon semi-finals and an injury at the US Open forced him into cutting the season short, opting to have surgery. He was absent for nearly three months and upon returning, he had to pull out of the Brisbane and Abu Dhabi events in the lead-up to this Australian Open. Rafa, who was previously the world number one, relinquished the title too. Novak had to endure a patchy couple of years on tour after winning five Slams across 2015 and '16, but the Serbian genius has reinvented his lost touch and defeated Nadal along the way to lifting his fourth championship at the All England Club in Wimbledon - defeating Kevin Anderson to glory. In the US, he looked in sublime form as he stomped his authority on the game once more with clinical performances at the Arthur Ashe Stadium. The two have played each other a massive 52 times, with Djokovic currently leading the Spaniard 27-25. In Grand Slam finals, they have played on seven occasions. Nadal leads the H2H, 4-3. In all their Grand Slam meetings, the Spaniard has won nine while Djokovic has only been victorious in five encounters to date. Combined, the pair have a total of 31 Grand Slam titles. Nadal leads with 17, Novak 14. The Australian Open Final between these two, their only previous encounter in the finals at Melbourne, is the longest tennis final lasting close to six hours. The final promises to be an enthralling contest, with both players expected to slug it out to lift the Norman Brookes trophy. The journey for both former champions has been fairly smooth up until now - Nadal is yet to drop a single set, while Novak has only dropped two. With plenty at stake for the two greats, it's certainly going to be a mouthwatering clash as two geniuses of the modern era renew their rivalry.